Much of my photography uses a variety of processes I refer to, collectively, as New Antiquarian. The term is inspired by Lyle Rexer's excellent book, Photography's Antiquarian Avant-garde: The New Wave in Old Processes, although I use it in a slightly different way. A common theme in my work is to use what are usually called "Alternative Process" techniques from the earliest years of photography, in combination with modern digital scanning, image processing and printing. I never add digital content to my photographs, but many of my techniques could not have existed in the pre-digital era. In particular, I look for old ways to make new negatives, often on paper, and from which a print could not be made with traditional darkroom processes. Below I give a brief description of some of these New Antiquarian processes. More details can be found in The Physics and Art of Photography. Cyanonegative Photography - Cyanotype sensitizer is applied to paper, which is placed in a specially-designed homemade camera. A fast, single-element lens is used to record a negative image onto the cyanotype paper. Bright sunlight and long exposures are required, even with the fast lens. 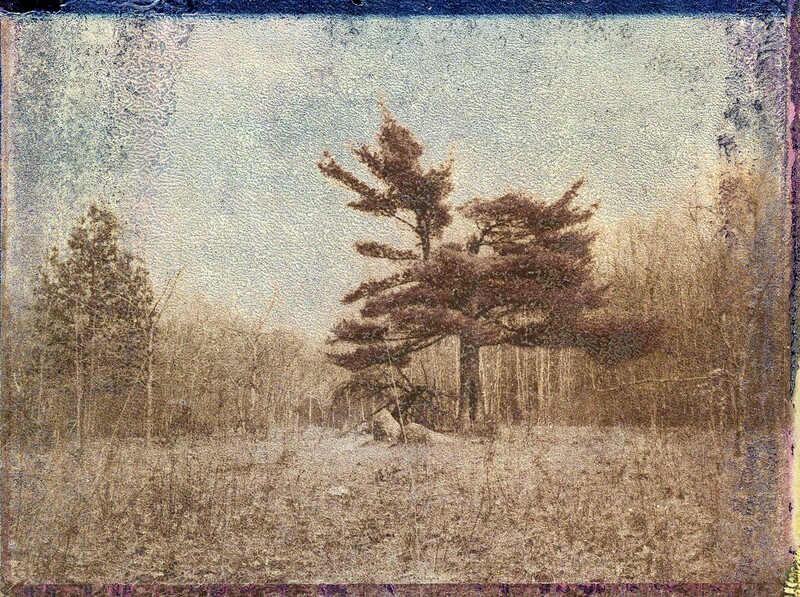 The resulting blue-toned paper negative is scanned and digitally inverted and printed, resulting in a sepia-toned positive. I developed this process starting in 1999, and I have exhibited cyanonegative (my own term for the process) photographs since 2003. In 2005 one of these photographs (St. Mary's Church) earned second place at Soho Photo Gallery's Krappy Kamera Competition. Other examples are Ash Tree No. 1, The Bird Cage and Self Portrait with Grid, No. 1. Ephemeral Process Photography -- Silver gelatin enlarging paper is used for printing out (no developer is used -- the silver is reduced solely by light), as in the lumen process. But I apply by hand -- selectively -- a non-developing accelerator that vastly increases the speed at which the paper prints out. Furthermore, I do not fix the images, so they are still sensitive to light. But once the accelerator is washed away and the paper is dried, they are not very sensitive to light. Thus they can be viewed briefly in dim light, or as negatives they can be scanned, and even printed in the black-and-white darkroom (I have modified my enlarger to project opaque paper negatives by reflection). I use this as a negative process, both from contact with standard color C-prints, and from life with cameras I have made or modified for wet paper negatives. The exposure times are long, but not as long as with cyanonegative photography. But as with that process, no darkroom is needed, although access to a "dimroom" is handy. In the field, I apply the accelerator and load the film holders on-site, right before exposure, in a manner reminiscent of the wet collodion process. But I don't need a dark tent -- I only need a dim tent. I also use this process to make ephemeral image-objects, that must be viewed only briefly and in dim light, or the acting of looking will significantly damage the image. Many examples of different variations on ephemeral process photography can be found here, and the technique is described in more detail in my three volumes of The Physics and Art of Photography. Polaroid Negative Transfers - It has long been popular to use the old peel-apart Polaroid film (still made by Fuji) to transfer an image to a nice piece of watercolor paper. Even apart from the use of a better paper substrate, such a Polaroid Transfer is unique; the imperfections of the transfer process add its own unpredictable content, and the colors and tones are altered. I often used this technique myself, especially since it allows one to combine multiple images onto one sheet of paper (see, for example, Maple and Along the Line). But more often, I make Polaroid transfers of negatives. I place an ordinary film negative in my enlarger (instead of a positive transparency), project it onto Polaroid film, and make a transfer onto watercolor paper. This negative-image Polaroid transfer is then scanned, digitally inverted to a positive, and printed. The resulting image preserves the interesting non-photographic detail introduced by the transfer process. But the reversal from a negative to a positive produces an image that looks completely unlike a tradtional Polaroid transfer. Some examples are Apple, On the Beach and Flying. The Part You Throw Away - I often scan directly the throw-away part of peel-apart Polaroid film. These never-meant-to-be-used negatives could not be printed in a traditional darkroom. The very narrow range of tones and hues, when scanned and stretched with digital image processing, exagerates the slightest imperfection in the negative, resulting in unpredictable non-photographic detail. Some examples are White Pine (Super Tree) No. 2 and I was Home. And some of these emulsions are easily solarized by flashing with light (see, for example, Campsite and Emma No. 2). Photogram Negatives - A photograph is a camera-less shadow print, and in its raw form it is usually a negative, since that is how most photographic processes work. Photograms made with traditional silver-based emulsions are easily reversed to a positive in the darkroom, but this is not so easy for photograms made with alternative processes such as cyanoytpe. And so I scan and digitally invert my alternative-process photograms to make a positive print. I produce, for example, cyanotype photograms by putting objects in direct contact with the cyanotype-sensitized paper. 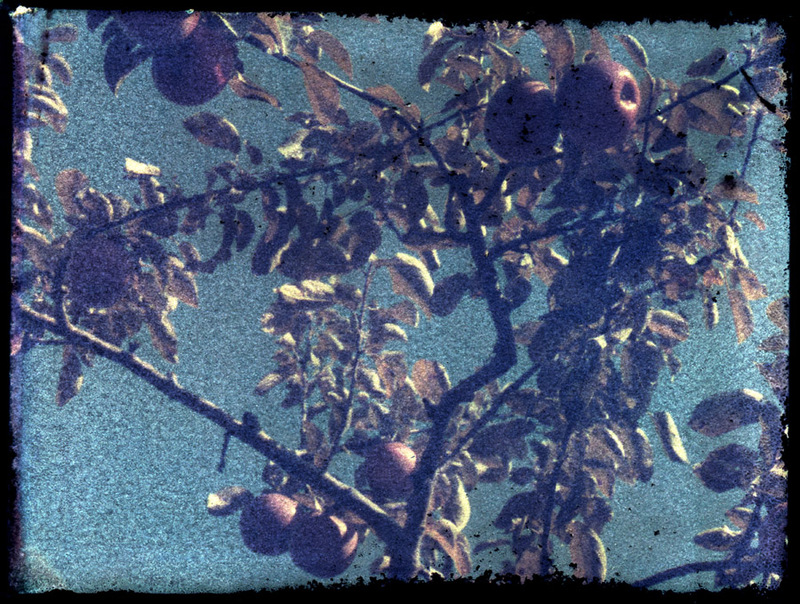 These blue-tone negatives are then scanned, digitally inverted to a positive and printed. As is the case for cyanonegative photography, the texture of the paper and the uneven coating of the sensitizer adds non-photographic content to the resulting image. See Paloverde and Dandelion for some examples. Besides cyanotype, I also make photogram negatives with ephemeral process; Three Reasons to Leave, Blue Monarch and Waiting for the Jaguar are examples. Instead of using sunlight, I sometimes expose the photograms by scribbling on them with a violet laser pointer to produce a very different effect (see Greenhouse, Oil and Sand and The Six Cornered Snowflake).